Covering 76,000 acres, the Fourmile Creek Watershed includes both agricultural land and rapidly expanding urban areas. Home to about 80,000 people, the watershed is unique in that it is focused primarily on urban improvement. The watershed’s northernmost reaches are located in Boone and Story counties and include portions of the cities of Sheldahl and Slater. 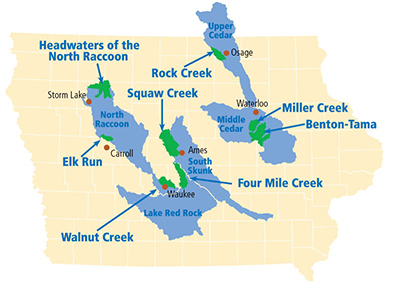 The largest area of the watershed is located in Polk County and encompasses the cities of Pleasant Hill, Ankeny, Altoona, Alleman, Elkhart and Des Moines. The objectives of this watershed project are to engage the public in watershed management for Fourmile Creek to address water quantity and quality concerns; develop new hydrologic and hydraulic models for existing and future conditions; prepare alternatives for flood reduction, water quality improvements and watershed management. Urban and rural leaders have been working to cooperatively engage in watershed planning and management through the Watershed Management Authority (WMA). The WMA provides a mechanism for cities, counties, the Soil and Water Conservation Districts (SWCD) and other stakeholders to work together. The team completed a watershed management plan in 2015 and it is being implemented to address water quality concerns of bacteria levels, excess nutrients (nitrogen and phosphorous) and erosion.